Korean Boxwood is the top choice boxwood for colder areas, because it is hardy through zones 4 and 5, and it grows well across most of the country. It forms an attractive mounded evergreen bush, even when left unclipped it will only grow 3 to 4 feet tall. 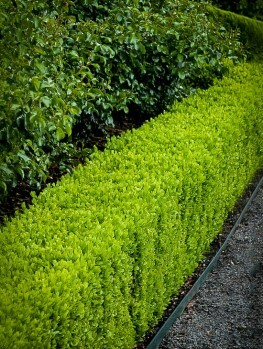 With clipping it can be kept as low as 12 inches, ideal for a beautiful edging along a path or around a garden bed. It can easily be turned into balls, cylinders, pyramids and other geometric shapes, to add interest to your beds. In Asian gardens it is clipped into irregular mounded forms, and it is an ideal addition to an Eastern-themed garden design. It can also be used in pots, alone or surrounded by annual flowers. Korean Boxwood will grow in any well-drained garden soil. Keep it well-watered during dry spells, and mulch over the roots to keep them cool in summer, prevent weed growth, conserve moisture and prevent root damage from digging. It will grow in sun or light shade, so it can be planted almost anywhere in your garden and it will thrive. 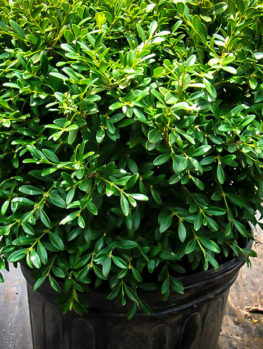 It is more resistant to pests than other boxwoods, and this popular plant is the number one pick for boxwood lovers everywhere. Flowering shrubs may be a great way to bring color into the garden, but every garden needs a core of green plants. It is best if these are evergreen, as they will always be attractive, and not spend part of the year as bare branches. These plants give structure and form to any garden, and without them it would be impossible to create an attractive, restful place to relax in. Very often, in all kinds of gardens, we want to clip these plants into hedges or different shapes, to give a more certain structure to the space, and make a geometry that contains the more random shapes of our other plants. 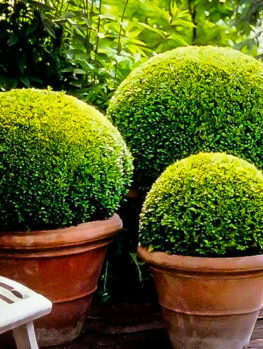 For centuries one of the most popular plants for this purpose has been boxwood. These small shrubs, with their tiny rounded leaves, clip easily, and the more they are clipped, the denser and more attractive they become. They are great favorites for rounded forms, or for low hedges to border garden beds, and they are indispensable for creating a well-structured garden. 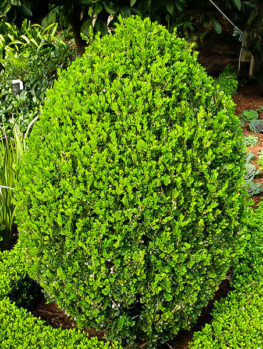 Korean Boxwood is a small, densely-branched shrub, with tiny evergreen leaves no more than ¾ of an inch long. These are leathery, with a glossy surface, and they are a rich neutral green, perfect with any other plant. Left unclipped it will grow into a rounded, irregular bush 2 to 4 feet tall, and the same across. This is not often done, but if you are a relaxed gardener, try it – the result is very attractive. Usually these plants are clipped into ball shapes, or even pyramids or cones, bringing interest and beauty to the garden. Another very popular use is as a low hedge, along a path or around a bed. 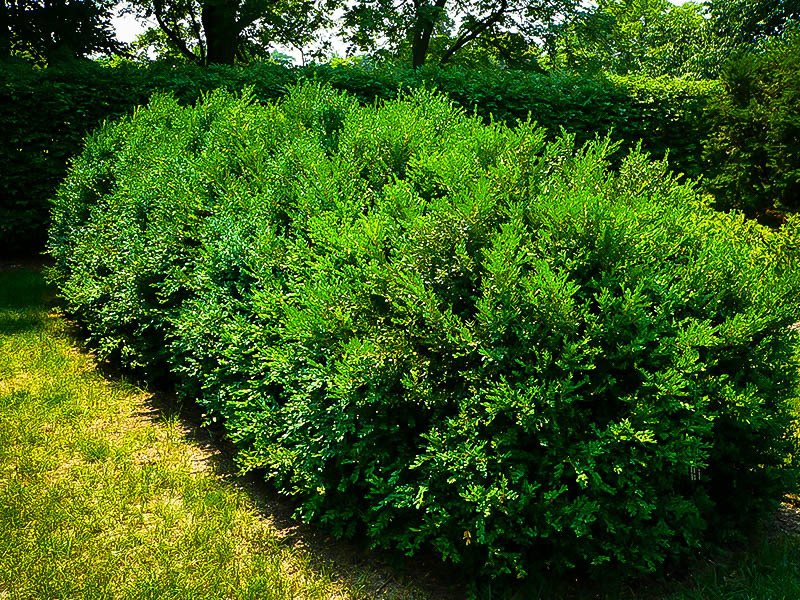 For hedges, plant at 12-inch intervals, spacing the plants evenly. 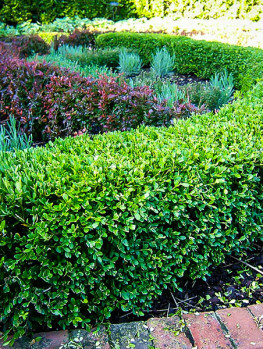 Clip lightly two or three times a year – the more you clip the denser your hedge will be. In cold areas, don’t clip after late summer, or the tender new shoots may be damaged in winter. When trimming, keep the top narrower than the bottom, so that leaves will continue to grow right down to the ground. Korean Boxwood is by far the best choice for cold gardens. It outperforms all other types, and even if there is a little winter browning, the plants quickly recover in spring, without any sustained damage. If you have tried to grow boxwood shrubs, and found it died in part, or completely, don’t give up. Plant the Korean Boxwood instead, and enjoy its hardiness and beauty, without facing dead plants each spring. The Asian boxwoods are far superior in colder areas, and Korean Boxwood is the top pick of them all. 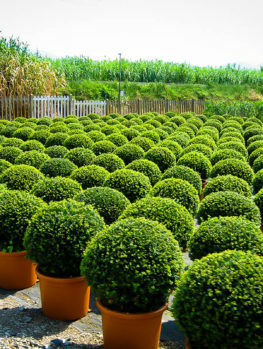 It will, of course, also grow well in warmer climates, up to and including zone 9, so it is ideal in Florida and southern California – wherever you live this is the perfect boxwood for all your needs. This plant grows well in almost any kind of soil, except for soils that are constantly wet. Some air must reach the roots for good health. It will grow happily in full sun, and it will be just as happy in shade for part of the day. It will even grow well in continuous light shade, perhaps beneath other shrubs and trees, where some sunlight comes through in patches. 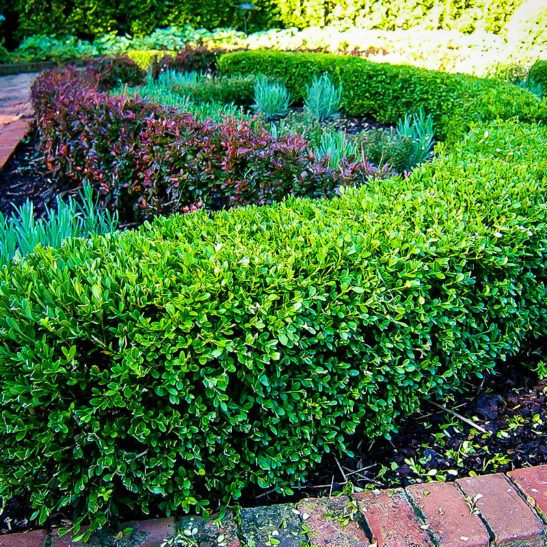 Trimmed boxwood needs extra nutrients to replace the leaves clipped off, so it should be fertilized more than regular shrubs. Use a fertilizer labelled for evergreen bushes, applying it in spring and again in summer. Young plants in their first few years will perform best if you use water-soluble fertilizers, or other liquid forms. Older plants can be fed more easily with granular formulations. As well, put organic mulch over the roots, and avoid disturbing the soil around the roots by digging or hoeing, as they are shallow and easily damaged. When European settlers came to America they brought with them their favorite plants, and among them was boxwood. Those who settled in colder areas and planted them, must have been disappointed that they often turned brown and died in part – or completely – in the cold of American winters. It was only when Americans started to bring plants back from Asia that help arrived. In Korea a boxwood was found that looks almost exactly like the European type, but which is a lot hardier, thriving in areas as cold as zone 4, where winter temperatures plunge to minus 30 degrees. 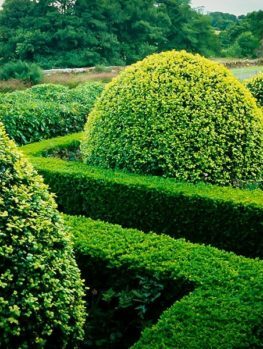 The Koreans also clipped their boxwoods, often into irregular ‘cloud’ shapes, and shapes like boulders, rather than the perfect geometry of European trimming. 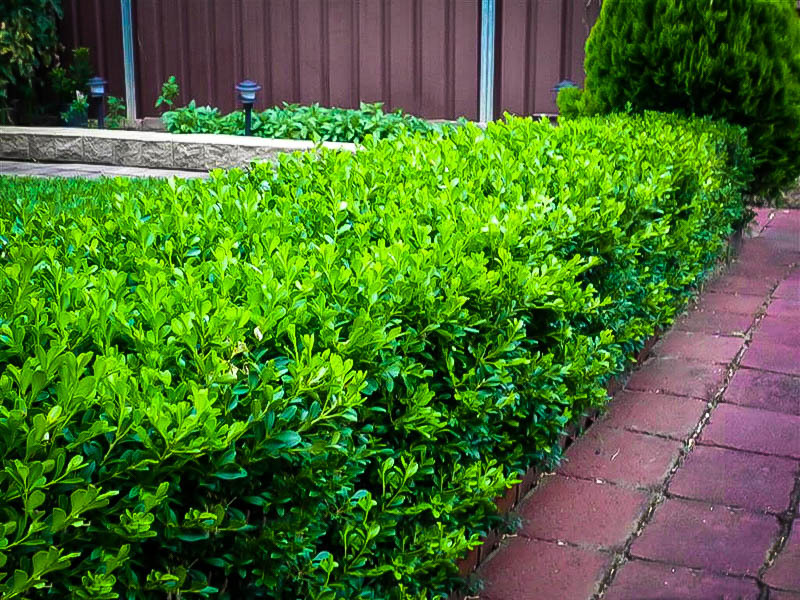 Korean boxwood (Buxus sinica var. insularis) is a relative of the Japanese Boxwood. It used to be called Buxus microphylla var. koreana, and it is still sometimes sold under this name. Asian boxwoods are much tougher than the European boxwood that early settlers brought to America for their gardens. If you live anywhere colder than zone 6 you will have problems with the European boxwood – its leaves will turn an ugly bronzy color in winter and young growth or whole branches can easily die. 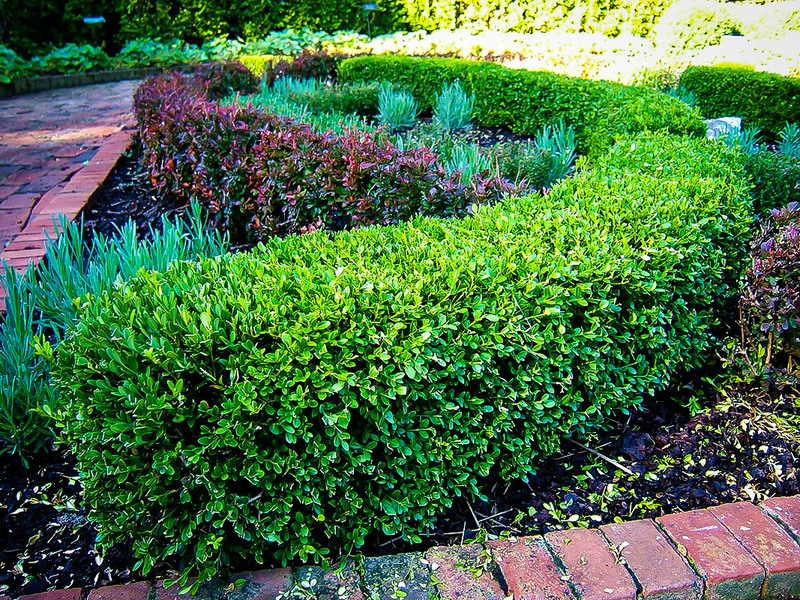 If you are buying boxwood, especially in colder areas, it is important to be sure to buy the right variety. It might be easy to find cheaper plants, but these will be of unknown origin. It is very difficult to tell one boxwood from another – only the weather will tell you, when it kills one but spares another. If you buy cheap plants, they could be any variety, so be sure to buy the true Korean Boxwood. Our plants are grown from stem pieces of carefully identified plants under controlled conditions. Korean Boxwood is a very desirable form of boxwood, so we know the demand is going to be high for the top-quality plant. Now is the time to measure that spot for the boxwood hedge you have always wanted, and then order right away to avoid being disappointed.